Audio will be uploaded to this page and the blog for online listening, and can also be heard on frequency 107.7 – locally at Kunstraum Kreuzberg / Bethanien. Moderated by: Diana McCarty (USA/DE), Valie Djordjevic (DE), Helena Božic (SI), Katja Kobolt (SI), Dunja Kukovec (SI). Last modified on 2008-06-20 12:35:31 GMT. 1 comment. Top. The HumorWorks show was recored on HFE betwen 9 – 11th of May, with randomly selected artists and curators of the HumorWorks exhibition, Dunja Kukovec and Katja Kobolt. Interviews include discusions on festival/exhbition related topics. Last modified on 2008-06-13 08:04:27 GMT. 0 comments. Top. Last modified on 2016-01-10 13:41:39 GMT. 0 comments. Top. A Skype discussion between Petra Vargova (CZ), VJ SymaQ (CZ) and Lucia Udvardyova (CZ) about women, technology and Eastern Europe. Part of CZ_Tech project by Lucia Udvardyova – www.cztch.wordpress.com. Last modified on 2008-06-02 08:24:30 GMT. 0 comments. Top. Last modified on 2008-05-28 08:04:06 GMT. 1 comment. Top. Interview with Gaia Novati, co-organizer of HACK.Fem.EAST. Diana McCarty lives and works in Berlin. She is a co-founder of bootlab and co-initiated the open source radio project, reboot.fm. 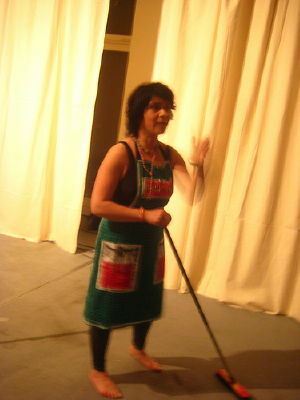 She is an active member of the Free Cultural Radio Network, Radia.FM. Together with Valie Djordjevic, Kathy Rae Huffman and Ushi Reiter, she runs the Faces mailing list for women in media. As part of the International Women’s University server development team, she worked with Seda Gürses, Barbara Schelkle, Prof. Heidi Schelhowe, and Heiki Pisch – and also worked to develop feminist pedagogical approaches to computing. In the mid-nineties, McCarty co-founded the Nettime Mailing list and as part of the Media Research Foundation, she co-organized the MetaForum Conference Series in Budapest. Her main interests are exploiting social and technological systems for cultural use; i.e. piracy and open source software development for real life. Valie Djordjevic lives and works in Berlin. She studied Comparative Literature, Slavic Languages and Film Studies. 1996 she started to work with Internationale Stadt Berlin, one of the first net culture projects in Germany. Since then she worked in different art and cultural projects including Old Boys Network and the Media Arts Lab at Künstlerhaus Bethanien. She is a member of mikro e.V. , a Berlin based association examining the different facets of media culture and list coordinator for the FACES mailing list, a women only list, dealing with topics around notions of gender, technology and art. She works in different contexts: writing, giving lectures on media culture, organizing events on the topics of gender, networking, information and art. She is an editor of iRights.info, an award-winning website about copyright in the digital age. She writes fiction and essays on art and culture and sometimes even makes art herself. Helena Boži? is a part of City of Women festival team. Since 1998 has she been a part of the Slovenia’s first and only independent radio station Radio Študent, where she’s been working on different fields: as an author of music broadcasts, as DJ, as an anchor, editor and music/film critic. For shorter period she worked as executive producer in fringe theatre. She has a university degree in Natural Sciences and works as a graphic designer. For the past seven years she has been a journalist for the informative program of Slovenian National television.